Hello everyone, my name is Mary and this blog is my journal of our renovation adventures while fixing up our 1960's Rancher. My husband and I are just the average DIYers on a budget and if we can do it, anyone can. My hope is that this blog can offer inspiration to others, as so many blogs have done for me and provide a tangible reminder or our renovation accomplishments! We purchased our home almost 6 years ago. 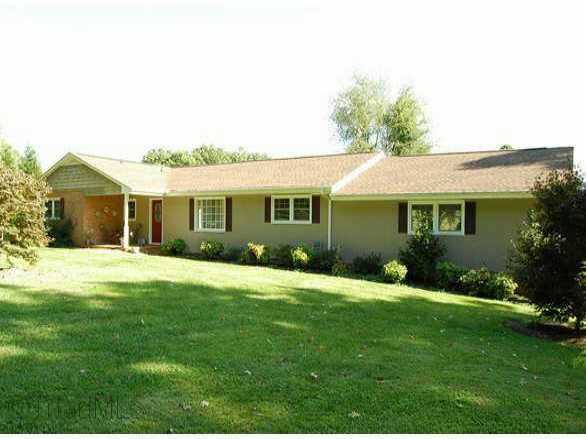 It was built in the early 1960's and is a ranch style with an in ground pool in the backyard. It has 3 bedrooms and 2 bathrooms on the main level along with a living room, den, dining room, and kitchen. The bathrooms had sort of been renovated (new unfinished builder grade vanities and ugly tile), the roof had recently been replaced, and the windows had all been replaced, except the huge picture window in the front room. It has beautiful (original???) hardwood floors throughout, except in the den. The basement is finished (hideously) with a living room area, office/bedroom, kitchenette and tiny bathroom, along with a 1 car garage and workshop. It was apparently converted into an in-law suite several years back. The house had great bones..and did I mention a pool?! And it was in a desirable school district which was important to me for my son, so we made an offer. We knew we would have to do some (OK, lots!) work on it...and so begins our renovation journey. I hope you will join me on this crazy adventure!